Karachi: “Considered one of the frontline defenders of human rights, protection of media personnel’s rights was, however, still a distant dream in Pakistan,” observed Solidarity Centre country programme manager Immad Ashraf on Wednesday. He was speaking at a day-long paralegal workshop titled ‘Communicating rights at work’, organised by IRADA – a not for profit organisation – in collaboration with Solidarity Centre. Advocate Aftab Alam, the trainer of the workshop, said the number of journalists in Pakistan had increased from 2,000 to over 18,000, whereas the number of other media industry workers from 7,000 to over 300,000 within a period of 13 years. The rapid growth in the industry was, however, accompanied with a decrease in respect for journalists’ basic labour rights, including fair wages, decent employment conditions, trade union rights and physical safety while on job, he added. Karachi Union of Journalists (KUJ) President Afsar Imran opined that existing laws were sufficient to ensure rights, but serious efforts were needed to see that they were implemented in letter and spirit. 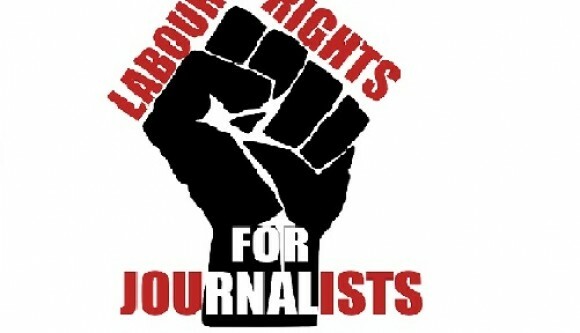 All Pakistan Newspapers Employees Confederation (APNEC) chairman Shafiuddin Ashraf observed, “It is us journalists who are to be blamed for the violations of our rights. We have to stand united to ensure we were given our due rights. Alam called for understanding laws of the media industry in order to make efforts for their implementation. The participants observed that journalists’ unions had no role in educating media personnel with respect to their rights and neither do they provide any assistance in case of victimisation. A need for local unions to work in close coordination with the International Labour Organisation (ILO) was also highlighted. The workshop was attended by senior representatives of APNEC, PFUJ, KUJ and journalists from all media houses.